(1995) observed the repair strategies of deletion, epenthesis, and devoicing of voiced ... consonants in coda, only with the exception of glottal fricative /h/. sequence of English codas, Broselow and Xu (2004) showed that voiceless obstruent codas are the easiest to acquire, voiced obstruent codas are the. form of a common word list to differentiate a set common words, Table ... 1. English na. 3. French c1. 1. German c1. 11 c2. 4 s1. 7 ot. 1. Hungarian c1. 2 c2. 2. 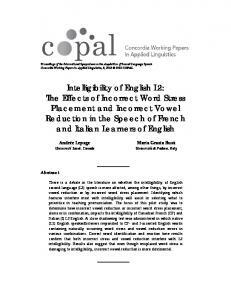 There is a debate in the literature on whether the intelligibility of English second language (L2) speech is more affected, among other things, by incorrect. intonation of English speech uttered by Mandarin speakers. The goal of our ... Chinese learners may read English with a syllable-timed rhythm. A previous ..... Online: http://anita.simmons.edu/~tobi/tutorial.html, accessed on. 19 Mar, 2010. 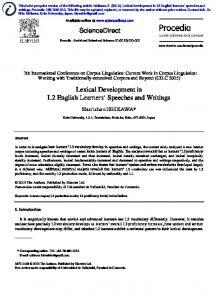 Ratings of L2 Oral Performance in English: Relative Impact of Rater ... 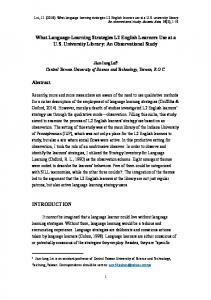 In rating English language speaking performances of nonnative speakers (NNSs),. Programa de PÃ³s-GraduaÃ§Ã£o em Letras da PUCRS. Porto Alegre, v. ...... DissertaÃ§Ã£o (Mestrado em Letras) â Universidade CatÃ³lica de Pelotas,. Pelotas, 2011. WTC was McCroskey and Richmond's (1982) study on shyness. Leary (1983) ... competence, and L2 motivation among junior high school L2 French immersion. simple past in L2 English, with a number of studies having focused on native speakers of ... of linguistic transfer in the acquisition of English simple past tense. The basic idea of the L2 Motivational Self System is that learners' ... Kim & Seo, 2012) or secondary school students (Hasegawa, 2004; Sakai & Kikuchi, 2009). Theory (BOERSMA & HAYES, 2001), the emergence of the acoustic patterns found in the ... provide answers for the research questions and suggestions for further research. 1 Review .... 2 For a more complete introduction to Gestural Phonology, we suggest the reading of Browman & ...... TESAR, Bruce; SMOLENSKY, Paul. THE ACQUISITION OF /p/ AND /k/ WORD-MID CODAS OF ENGLISH (L2) BY LEARNERS FROM SOUTHERN BRAZIL (L1): A GESTURAL ANALYSIS IN STOCHASTIC OPTIMALITY THEORY A AQUISIÇÃO DAS CODAS MEDIAIS /p/ e /k/ DO INGLÊS (L2) POR APRENDIZES DO SUL DO BRASIL (L1): UMA ANÁLISE GESTUAL NA TEORIA DA OTIMIDADE ESTOCÁSTICA Bruna Koch Schmitt* Ubiratã Kickhöfel Alves** Abstract: In this article, we formalize the acquisition of word-mid /pt/ and /kt/ sequences in English (L2) by learners from Southern Brazil. The participants, who presented a basic proficiency level in English, had their productions recorded both in English and in Brazilian Portuguese, which allowed for an analysis of the acoustic patterns found in the production of /p/ and /k/ obstruent codas. The acoustic patterns produced by the learners were analyzed using the Stochastic-Optimality Theory, and the constraints used in the analysis were based on the framework of Gestural Phonology (BROWMAN & GOLDSTEIN, 1992) and in the gestural landmarks proposed by Gafos (2002). We conclude that a gestural analysis allows for the formalization of a wider range of acoustic patterns which tended not to be considered in traditional accounts of phonology, as these patterns assume a different status since they are then considered to be part of the grammar. Keywords: Phonetic-phonological Acquisition; Gestural Phonology; Stochastic Optimality Theory. Resumo: Neste artigo, formalizamos a aquisição, por parte de aprendizes do Sul do Brasil, das sequências /pt/ e /kt/ em posição medial de palavras do inglês (L2). Os participantes, que apresentavam um nível básico de proficiência na língua estrangeira, tiveram suas produções orais gravadas tanto em português quanto em inglês, para a posterior verificação dos padrões acústicos encontrados nas tentativas de produção das codas /p/ e /k/. Estes padrões acústicos foram analisados à luz da Teoria da Otimidade Estocástica, e as restrições utilizadas na análise foram baseadas no modelo da Fonologia Gestual (BROWMAN & GOLDSTEIN, 1992) e na noção de pontos de ancoragem gestuais proposta por Gafos (2002). Concluímos que uma análise gestual permite a formalização de uma série de padrões acústicos que tendiam a ser desconsiderados pelas análises fonológicas tradicionais, uma vez que tais padrões assumam um status diferenciado, como componentes da gramática do indivíduo. Palavras-chave: Aquisição Fonético-Fonológica; Fonologia Gestual; Teoria da Otimidade Estocástica. Introduction In this article, we aim to formalize the acquisition of word-mid /p/ and /k/ codas in English by Southern Brazilian learners. English and Brazilian Portuguese (BP) syllable patterns differ in terms of the segments allowed in coda position: Brazilian Portuguese does not allow obstruents in codas, with the exception of /S/ (Coda Condition, BISOL, 1999), whereas English permits all consonants, with the exception of /h/, to be in coda position (HAMMOND, 1999; ALVES, 2008). However, in some dialects of Brazilian Portuguese, the coda obstruent may surface variably (Coda Condition Weakening, BISOL, 1999), which may occur due to either intra-speaker or inter-dialectal variation. As we consider the ‘gaúcho’ dialect of Brazilian Portuguese (spoken in the state of Rio Grande do Sul), the /p/ and /k/ in word-mid codas may surface either as the coda of the syllable or as the onset of a new syllable, by means of inserting an epenthetic vowel and the consequential resyllabification of the stop segment: “rapto” – [xa.pi.tu]~[xap.tu] (LUCENA & ALVES, 2010). As the stop consonant may emerge variably in this dialect, this might cause phonetic-phonological transfer from Brazilian Portuguese (L1) to English (L2). In this sense, many of the phonetic patterns which occur variably in the learners’ L1 may also be found in their productions of English (L2). 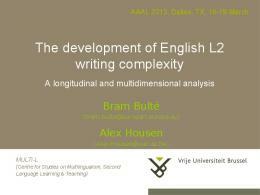 These facts considered, this study seeks to formalize, in Stochastic Optimality Theory (BOERSMA & HAYES, 2001), the emergence of the acoustic patterns found in the oral production of learners who present a basic level of proficiency in English. By using phonological gestural landmarks as primitives (GAFOS, 2002), we intend to capture the acoustic patterns produced by these learners and account for the grammar responsible for their output patterns. Simulations of the stages of the acquisition were performed using the Gradual Learning Algorithm in Praat 5.2.21 (BOERSMA & WEENINK, 2011). The present study aims to address the following research questions: a) What are the acoustic patterns produced by Southern Brazilian learners in the acquisition of English word-mid /p/ and /k/ codas? How can these patterns be formalized in an Optimality-theoretic framework, using gestures as phonological primitives? b) Which gestural constraints are involved in the acquisition of the English wordmid /p/ and /k/ codas by Brazilian learners? The software Audacity may be downloaded at http://audacity.sourceforge.net/. The software Praat may be downloaded at http://www.fon.hum.uva.nl/praat/. Transitional Vowel: The spectrogram in figure 11 presents a voiceless articulation after the release of stop that is inconsistent with a typical stop release. We assume in this study that this pattern, which presented high rates of production among the learners, is consistent with the landmark proposed by Gafos (2002) presented in section 4.2. This landmark is also used by Davidson (2006) to represent a transitional schwa or transitional vowel (hence our use of the term, even though in our study we have not carried out an articulatory analysis of this pattern, which is needed for future studies). The following table presents the acoustic patterns produced by the participants, as well as their relative frequencies, expressed in percentages. This corresponds to an open transition: In a number of languages and in the relevant environments whose identity is not important in the present context, a sequence of two heterorganic consonants is produced with an intervening acoustic release, also known as an ‘open transition’ (Bloomfield 1933). For example, in Moroccan Colloquial Arabic (henceforth, MCA), the active participle of the verb ‘to write’ is [katb], with a schwa-like vocalic transition in the final CC cluster. […] The relation in (2b) is such that the onset of movement for the lips gesture for /b/ is initiated around the mid-point of the tip-blade gesture for /t/, the c-center of /t/ – indicated as ‘cc = o’. As a consequence of this relation, the achievement of the target for the /b/ gesture, lip closure, takes place after the release of the /t/ gesture. There is, thus, a period of no constriction in the transition between /t, b/ that is identified as a schwa-like vocalic element. (GAFOS, 2002, p. 03). In this relation, the c-center of C1's oral gesture is synchronous with the onset of C2's oral gesture, that is, ALIGN(C1, C-CENTER, C2, ONSET). The annotation ‘open vocal tract’ indicates that there is a period of time between the articulatory release of the first gesture and the achievement of the target of the second gesture. This period of time corresponds to the acoustic release that is characteristic of an open transition. (GAFOS, 2002, p. 14-15). same value as faithfulness constraints, since markedness constraints militate against marked structures, favoring simpler or easier ones, and the alignment constraints which are used in our study do not favor unmarked forms or structures which tend to be produced more frequently in L1 acquisition. In the next section, we see the aforementioned constraints in action, as they interact to account for the learners’ grammar system. 3.3 GLA Simulations In this section, we present the results of the simulations of the acquisition of the heterosyllabic /pt/ and /kt/ sequences by Brazilian Learners in Stochastic Optimality Theory. In order to run the simulations, we used the Gradual Learning Algorithm which is available on the software Praat v. 5.2.21 (BOERSMA & WEENINK, 2011). In what follows, we present the tables generated by the software representing each one of the developmental stages of the grammar, as well as the Output Distributions13 for each grammar. The algorithm was fed with an input of approximately 100,000 tokens of the grammar we want to simulate, with the ranking values for each constraint, the plasticity values (standard value 0.1), and the disharmony values. The optimal candidate was indicated by a pointing hand. The section is organized as follows: firstly, we present the grammar of English, which corresponds to the target system to be acquired. After that, we analyse the interlanguage grammar: we start by simulating the learners’ L1 system (Brazilian Portuguese) and then, by using the L1 grammar as an initial stage, we present the grammar responsible for the interlanguage patterns shown in Table 03. As we consider the grammar that accounts for the Brazilian Portuguese data presented in Table 03, we see that, in a similar fashion to what occurred in the English grammar, DEP must fully outrank *COMPLEX (oral clo G), which, in the participants' dialect, needed to be demoted. Since the Brazilian Portuguese productions also presented occurrences of voiceless epenthetic vowels, ALIGN(c-o), Time I-O and ALIGN(r-t) need to overlap so that the three patterns (voiceless epenthetic vowels, released and unreleased codas) can emerge. At the evaluation time shown in Figure 20, ALIGN(c-o), which assumes a disharmony value of 55.058, outranks the other two constraints (TIME-IO: 50.835; ALIGN(r-t)- 46.716) and, therefore, allows voiceless epenthetic vowels to surface as the output. As indicated by the ranking values and the output distributions themselves, this tends to be the most common output pattern obtained from this grammar (reflecting, therefore, the data shown in Table 03), although there shall be moments at which TIME-IO or ALIGN(r-t) will take the lead in order to account for the emergence of released and unreleased stop codas, respectively. Since voiceless epenthetic vowels do not occur in English (as shown in the target grammar shown in 18), the acquisition of the L2 grammar would imply a lower position of ALIGN(c-o). This will be seen as follows. 3.3.3 Brazilian Portuguese-English Interlanguage Departing from the L1 grammar values (shown in Figure 20 above), we simulated the learners´ developmental grammar that accounts for the output patterns presented in Table 03.
different phasing relation between gestures, as languages differ from each other in view of the timing and phasing relations presented by gestures. The adoption of a gestural input is also in accordance with Goldstein & Fowler (2003), who argue in favour of a single primitive in both perception and production. Further studies, which should also insert the perceptual component of the grammar, might be relevant so as we can go further in the discussion on phonological primitives in L1 and L2 acquisition, as well as on phonological theory itself. The present analysis, which conceives that more finegrained phonetic detail should be implemented by the grammars of the world’s languages, represents an attempt towards this relevant research agenda. References ALBANO, Eleonora Cavalcante. O gesto e suas bordas: esboço da fonologia acústicoarticulatória do Português Brasileiro. Campinas: Mercado de Letras, FAPESP, 2001. ALLAN, Dave. Oxford Placement Test 1. Oxford University Press, 2004. ALVES, Ubiratã Kickhöfel. A aquisição das seqüências finais de obstruintes do inglês (L2) por falantes do Sul do Brasil: análise via Teoria da Otimidade. 2008. 337 f. Tese (Doutorado em Letras) - Programa de Pós-Graduação em Letras, Pontifícia Universidade Católica do Rio Grande do Sul, Porto Alegre, 2008. _____. A epêntese vocálica na aquisição das plosivas finais do inglês (L2): tratamento pela OT Estocástica e pela Gramática Harmônica. In: SIMPÓSIO SOBRE VOGAIS, 2., 2009, Belo Horizonte. Belo Horizonte: UFMG: SISVOGAIS, 2009. Disponível em: . Acesso em: 19 ago. 2009. _____. Discutindo as restrições de marcação posicional: uma proposta da formalização da diferença de ponto de articulação em coda. Revista da ABRALIN, v. 10, p. 113-146, 2011. ASHBY, Michael; MAIDMENT, John. Introducing Phonetic Science. United Kingdom: Cambridge University Press, 2005. BISOL, Leda. A sílaba e seus constituintes. In: NEVES, Maria Helena de Moura (Org.). Gramática do Português Falado – Volume VII: Novos estudos. Campinas, Editora da Unicamp, 1999. p. 701-742. BOERSMA, Paul; WEENINK, David. Praat: Doing Phonetics by Computer. - versão 5.3.01, 2011. BOERSMA, Paul. ; HAYES, Bruce. Empirical tests of the Gradual Learning Algorithm. Linguistic Inquiry, Cambridge, v. 32, n. 1, p. 45-86, 2001. BOERSMA, Paul. How we learn variation, optionality, and probability. University of Amsterdam, Proceedings of the Institute of Phonetic Sciences 21,1997, p. 43–58. BROWMAN, Catherine P.; GOLDSTEIN, Louis M. Towards an articulatory phonology. Phonology Yearbook, v. 3, p. 219-252, 1986. BROWMAN, Catherine P.; GOLDSTEIN, Louis M. Articulatory gestures as phonological units. Phonology 6, p. 201-251, 1989. BROWMAN, Catherine P.; GOLDSTEIN, Louis M. Tiers in articulatory phonology, with some implications for casual speech. In: KINGSTON,T. ; BECKMAN, M. E. (Ed.). 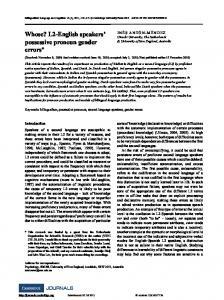 Papers in Laboratory Phonology I: Between the Grammar and Physics of Speech. Cambridge University Press, 1990. p. 341-376. BROWMAN, Catherine P.; GOLDSTEIN, Louis M. Articulatory Phonology: An Overview. Phonetic, v. 49, p. 155-180, 1992. CARDOSO, Walcir. The variable development of English word-final stops by Brazilian Portuguese speakers: A stochastic optimality theoretic account. Language Variation and Change, v. 19. Cambridge, Massachusetts: Cambridge University Press, 2007. DAVIDSON, Lisa. Phonotactics and articulatory coordination interact in phonology: evidence from nonnative production. Cognitive Science, v. 30, n. 5, p. 837-862, 2006. FERREIRA-GONÇALVES, Giovana. Aquisição da Linguagem. In: BISOL. Leda; SCHWINDT, Luiz (Org.). Teoria da Otimidade: Fonologia. Campinas, SP: Pontes Editores, 2010. p. 167206. FERREIRA-GONÇALVES, Giovana; ALVES, Ubiratã Kickhöfel. Os gestos em restrições: Fonologia Gestual e Teoria da Otimidade. In: FERREIRA-GONÇALVES, Giovana; BRUMDE-PAULA, Mirian (Org.). Dinâmica dos movimentos articulatórios: sons, gestos e imagens. Pelotas: Editora da Universidade Federal de Pelotas, 2013. p. 37-65. GAFOS, Adamantios. A grammar of gestural coordination. Natural language and linguistic theory, 20 (2), p. 269-337, 2002. GOLDSTEIN, Louis; FOWLER, Carol A. Articulatory Phonology: a phonology for public language use. In: MEYER, A. S.; SCHILLER, N. O. (Ed.). Phonetics and Phonology in Language Comprehension and Production: Differences and Similarities. Mouton de Gruyter, 2003. p. 159-207. GNANADESIKAN, Amalia E. Markedness and Faithfulness Constraints in Child Phonology. 1995. HAMMOND, Michael. The Phonology of English: A prosodic-optimality theoretic approach. Oxford University Press, 1999. HUF, Júlia Carolina Coutinho; ALVES, Ubiratã Kickhöfel. A produção de /p/ e /k/ em codas simples e complexas do inglês (L2) por aprendizes gaúchos: discussão a partir dos padrões acústicos encontrados. Verba Volant, v. 1, n. 1. Pelotas: Editora e Gráfica Universitária da UFPel, 2010. KAGER, René. Optimality Theory. Cambridge: Cambridge University Press, 1999. LUCENA, Rubens Marques de; ALVES, Ubiratã Kickhöfel. Implicações dialetais (dialeto gaúcho vs. paraibano) na aquisição de obstruintes em coda por aprendizes de inglês (L2): uma análise variacionista. Letras de Hoje, Porto Alegre, v. 45, n. 1, p. 35-42, jan./mar. 2010. QUINTANILHA-AZEVEDO, Roberta. Formalização fonético-fonológica da interação de restrições na produção e na percepção da epêntese em variedades do português. Projeto de Tese de Doutorado. Universidade Católica de Pelotas, 2014. PRINCE, Alan; SMOLENSKY, Paul. Optimality Theory: constraint interaction in generative grammar. Baltimore: The Johns Hopkins University, 1993. SILVEIRA, Rosane. The influence of pronunciation instruction on the perception and the production of English word-final consonants. 2004. Tese (Doutorado em Letras) – Programa de Pós-Graduação em Letras/Inglês e Literatura Correspondente, Universidade Federal de Santa Catarina, Florianópolis, 2004. TESAR, Bruce; SMOLENSKY, Paul. Learnability in Optimality Theory (long version). Report Nº. JHU_CogSci_96_3. Baltimore, MD: Johns Hopkins University, 1996. Recebido em junho de 2014. Aceito em novembro de 2014. 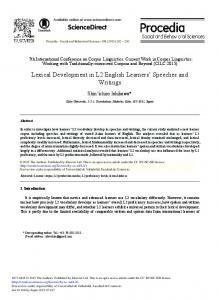 Report "WORD-MID CODAS OF ENGLISH (L2)"